Setting priorities is one of the main management functions of an organization. If the managers do not prioritize their tasks and organizational objectives, the organization will head towards the wrong direction and eventually collapse. A Pareto Chart can be used when it comes to identifying the facts needed for setting priorities. 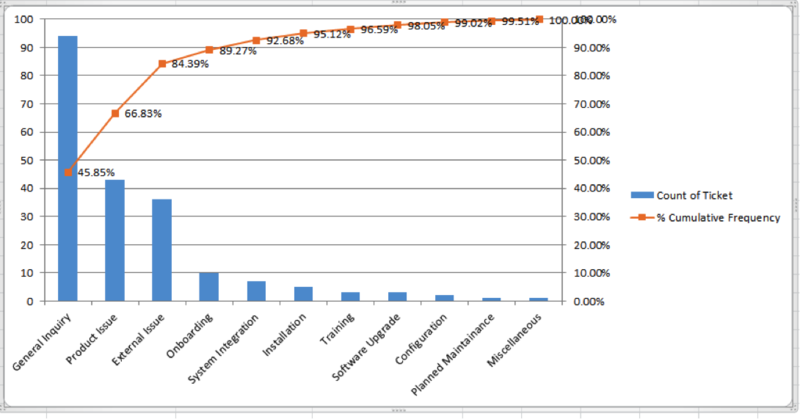 Pareto charts clearly illustrate the information in an organized and relative manner. This way, management can find out the relative importance of problems or causes of the problems. When it comes to prioritizing the causes of the problem, a Pareto chart can be used together with a cause-and-effect diagram. Pareto charts are created based on the Pareto principle. The principle suggests that when a number of factors affect a situation, fewer factors will be accountable for the majority of the affectation. This is almost the same as the 80/20 theory, which says that 80% of the impact is made by 20% of causes. Sort this data in descending order by selecting cell B and clicking Data > Sort Largest to Smallest icon. Your values in column B are in descending order now. Then calculate the Cumulative Frequency by entering this formula =B2 into the cell C4 in this case, and press Enter key. Calculate the Cumulative Percentage. For example, in cell D2, input this formula =C2/$C$12 (the cell C4 indicates the number of the first Ticket Count and the cell C11 contains the total number of complaints) and then drag the formula down to fill the range you want to use. Once you close the dialogue box, you will see that the secondary axis has been added to the chart. 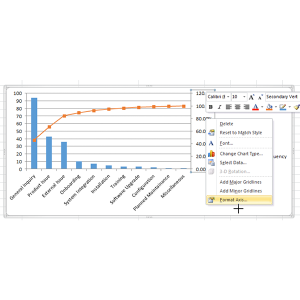 Select the percentage axis and right click to choose Format Axis. This shows that almost 80% of the tickets in production are purchased because of general inquiry and product issue, which is almost 20% of the total tickets in the categories. Now to reduce the flow of new tickets to production, we need to create a strategy to target these two vulnerable areas. Alok Awasthi is a Team Lead – Technical Services for 3Pillar Global. He has almost 8.5 years of experience in L2/L3 production support, application support management, problem management/incident management, and customer relationship management. He also has a strong knowledge of UNIX and UNIX Shell Scripting, as well as SQL and Oracle.